On November 14, 1910, Princess Clementine of Belgium, the youngest daughter of the late King Leopold of Belgium, was married to Prince Victor Napoleon, grand-nephew of the great Napoleon, at Moncalieri, near Turin. Prince Victor was forty-eight years of age at the time of the wedding, and his Royal bride thirty-eight. The marriage was the climax of a romantic attachment. Eight or nine years previously the two met at Brussels and fell in love with each other. But the late King Leopold strongly objected to the marriage. He hated the Bonapartes. There was, therefore, a secret betrothal, and when King Leopold died, the only obstacle to the marriage was removed. The wedding presents were valued at over £80,000. The Prince and Princess have taken up their residence near Turin, with the bride-groom's mother, Princess Clothilde of Savoy, who is only sixteen years older than her son. H.R.H. 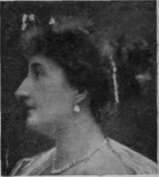 Duchess of Connaught IV. & D. Downey and fell in love with each other. But the late King Leopold strongly objected to the marriage. He hated the Bonapartes. There was, therefore, a secret betrothal, and when King Leopold died, the only obstacle to the marriage was removed. The wedding presents were valued at over £80,000. The Prince and Princess have taken up their residence near Turin, with the bride-groom's mother, Princess Clothilde of Savoy, who is only sixteen years older than her son.